In addition to her five gold medals, Simone Biles is now poised for another super Rio Olympics experience. She’s been chosen as the Team USA flag bearer for closing ceremony on Sunday. This quite an honor for Miss Biles as she is only the second American gymnast to carry the flag in an opening or closing ceremony after Alfred Jochim in 1936. Though it was largely expected given her dominance in the sport over the past three years, Biles’ competition here was a resounding success, reports USA Today Sports. She led the Americans to a second consecutive team gold medal by an eye-popping eight points before winning the all-around title, gold medals on vault and floor exercise and bronze on balance beam. Her five medals matches marks set by Nastia Liukin in 2008, Shannon Miller in 1992 and Mary Lou Retton in 1984. Her success here only added to the consensus that she’s the best gymnast of her time and probably the best ever. None other than Bela and Martha Karolyi, Retton and Aimee Boorman, Biles’ longtime coach, think the case is clear. Biles, 19, entered these Games as the three-time defending world all-around champion. Her 10 gold medals earned over that span is a record for any gymnast, and she has 14 total medals from world championship competition. Gabrielle Douglas & Simone Biles Bring Their Black Girl Magic To The Cover Of ‘Teen Vogue’Douglas made history by becoming the first African-American to become the individual all-around champion at the 2012 Olympics, and she’s the first all-around to make a second Olympic team since 1980. Still, the ladies aren’t resting. 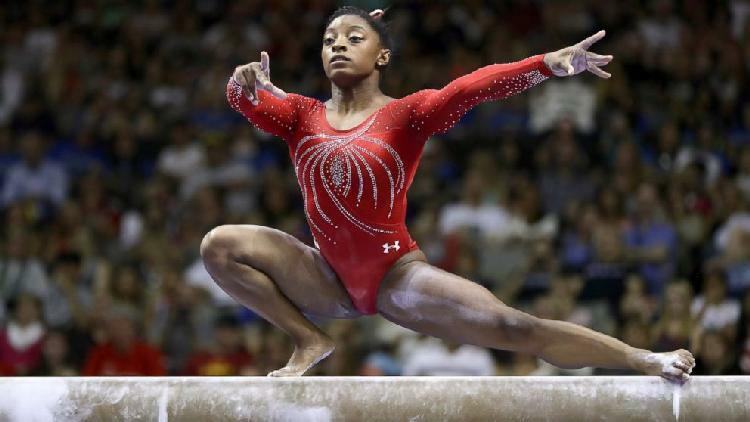 Biles told ESPN, “I think we can all get better. I know I can get better. I’m saving it for Rio.”Congrats on your amazing achievement, Simone and Gabby! ST. LOUIS — At the end of the United States women’s gymnastics championships here on Sunday night, so many gold medals hung around Simone Biles’s neck that when she walked, they clinked so loudly it made her giggle. A few times, she grabbed her medals to silence them and laughed yet again. “I always have so much fun,” Biles said later, after she had won her fourth straight national title in the all-around event and gold medals in three of the four individual events. The last time a woman had won a fourth consecutive national title in the all-around was 42 years ago. That’s easier said than done in elite gymnastics, a sport that can be a dangerous endeavor. One slip could break bones or tear ligaments, or possibly something worse. But this happy-go-lucky attitude in a grueling, often solemn sport works for Biles, the three-time defending world champion in the all-around. And it makes perfect sense that it works. After all, it’s fun to compete when you win and win and when the word around the sport is that you’re the best gymnast ever. Mary Lou Retton, the Olympic gold medalist in the all-around in 1984, has called Biles the top gymnast in history. Nastia Liukin, the Olympic gold medalist in 2008, has said that Biles is a lock for the gold medal at the Rio Games in August and that the real competition is for second place. During the two-day national championships here, which were a warm-up for next month’s Olympic trials in San Jose, Calif., Martha Karolyi, the women’s national team coordinator, watched Biles’s routines closely — often with eyes opened extra wide. After several of Biles’s big performances — and nearly all of them were big performances — Karolyi said, “Wow!” It was a substantial reaction from a woman who is the opposite of effusive: She gave two slow claps to Gabrielle Douglas’s floor exercise on Sunday, and Douglas is the reigning Olympic champion in the all-around. NEWARK, N.J. – The world championships silver medal should have been enough to erase any doubt in Gabby Douglas’ comeback. But in case any doubts lingered, she put more to rest on Saturday. Now 20, Douglas wants to achieve more in the Olympics. She set herself on that path by winning the American Cup at the Prudential Center, earning her first trip to the top of the podium since winning the Olympic all-around in London in 2012. To be sure, part of those doubts are the challenge. Since 1980, only six American women have gone on to compete in a second Olympics. No woman has repeated as gold medalist since Věra Čáslavská in 1968.